UPDATE: Check out the finished version of my File Cabinet makeover here, complete with free binder printables! Today I took a break from the standard Saturday decorating+renovating to practice another one of my most favorite pastimes… organizing. I loved the look of it and immediately pictured the perfect spot for it over our desk. I hadn’t really thought out the logistics of it at that point, but I knew I’d find a way to make it work. Can’t go wrong with them at that price, right? But then came the challenging part… figuring out how to organize all our papers within these boxes. They aren’t really meant for that, as they are magazine files, so I had to get creative. Then, in a moment of genius, a binder popped into my head. 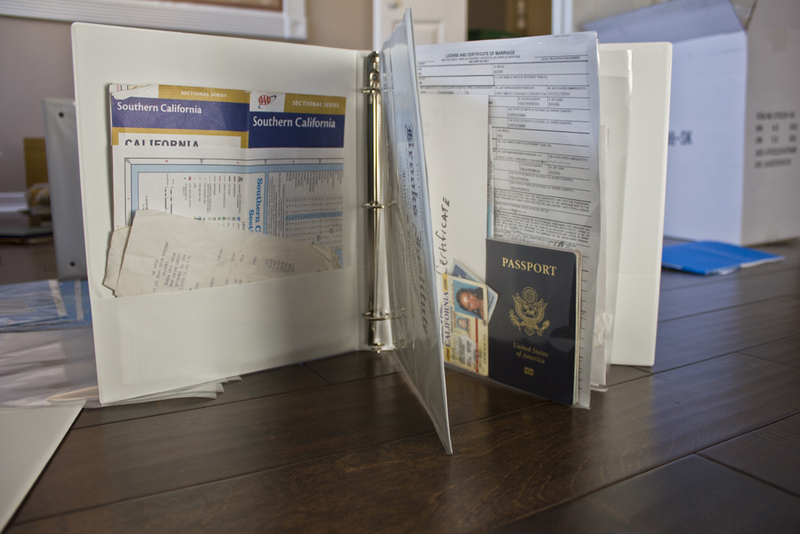 Inside the binder were clear sleeves, which held not only paper but all the loose miscellaneous things that often need to be filed. Bin-go! Once the idea was planted, I couldn’t wait to get to Target and start browsing the aisles for all of the exciting ways to fulfill my organizational fantasies. Good plan, right? I thought so. Okay, duh. How did I not even consider that. My plan B then became to ditch most of the boxes, use just the binders, line them up, slap labels on them and call it a day. 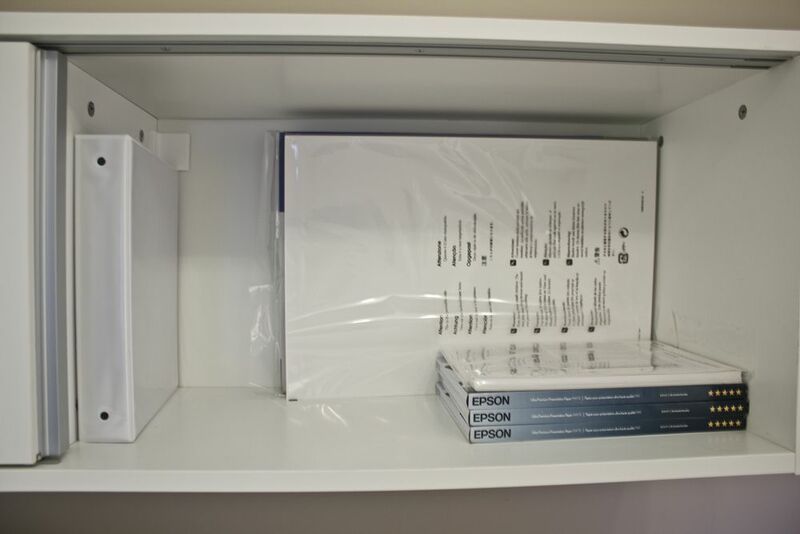 I would use some boxes for bulkier items (product manuals, legal sized loan docs, etc). This doesn’t look like much, but I swear there was ridiculous amounts of crap to sort through! This was at least a two hour process, maybe three… see that stack in the back right that’s a foot high? That’s our first house. So.Much.Crap. Anyway… about half of everything was discarded, and then it was time to get down to business. 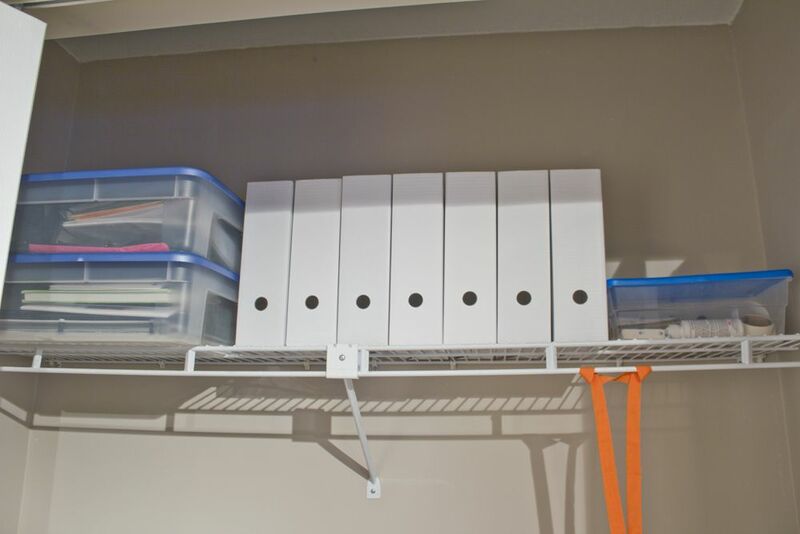 If you are OCD about organizing like me, then this pic should make you breathe a sigh of relief. I know I’ve been for the past couple hours now that it’s all done. It will basically just be used to hold my paper, and some packing materials once I get them ordered. Be back tomorrow for some fun wall art! Great job! I use binders too and they're so much easier to keep up with. We had the exact same problem with those paper holders and binders! 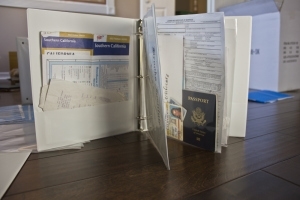 love these ideas….I have tried to use binders before but never wanted them 'out' so I went back to files. This is a great option! We also just moved across the country and with a completely different floor plan, we are still fine tuning this part of our home. I found your page from I Heart Organizing and I'm so glad you shared! I also found your blog through IHeart Organizing. I LOVE this idea. 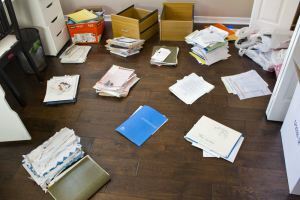 I'm a teacher, and I switched to binders years ago for all of my lesson plans/materials in order to ditch the traditional filing system, but I honestly never thought about doing the same with my home files. Duh! What a great idea. I can't wait until summer to get organized. Thanks for the idea. Also found you on Iheartorganizing and I LOVE this idea. We are moving next week and all I wanted to do for 4 years is ditch our filing cabinet. Now I know how to replace it! Thanks so much for sharing!! You are a genius! Found you through Iheartorganizing and I've never been more excited and ready to do a project before!!! This will simplify our life like crazy!!!!! Thanks for sharing every detail!!! This is such a fantastic idea! Just wondering how you separate things in your Finances binder. Does each bill get a page protector for things to slip in? Or do you file your bills by month? Just wondering what works for you. Thanks! I found you through Iheartorganizing and LOVE this idea. I knew there was a reason I was putting off going through all my piles of papers to save! 🙂 Thank you SO much for sharing. I can't wait to get started! 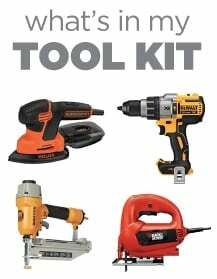 This is a great system. I tried the binders a few years ago, but I may try again now that I've seen this. My problem was that everything got so FAT because I wasn't sure when I could actually throw away/shred stuff. So…then I kept it for way too long and then it was disorganized. Can you maybe give us a little more information about how you organize within each binder? I think that would be very helpful! For instance, with me, I had a retirement section, but then I had different types of papers for that section, so I wasn't sure how to organize. Thanks! Love this!! 🙂 New follower! Hope you have time to check my blog out also! I strive to be that organized! The only comment I have on this is that I would keep my passport/ birth cert/ etc in a fireproof safe instead of in a binder. I've got a small safe box that fits on my shelf where I keep the things that I would not want to replace in event of an emergency. I love this. So simple. I hope you don't mind but I am stealing this idea and will be doing my project this week. 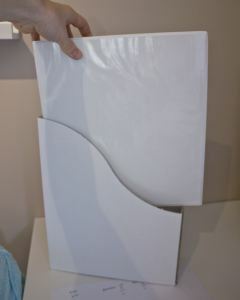 I really like the paper you used on the spines of the binders. If this scrapbook paper or did you print it from somewhere? I love your blog and your approach to projects. I too keep important papers in binders.. or binder. 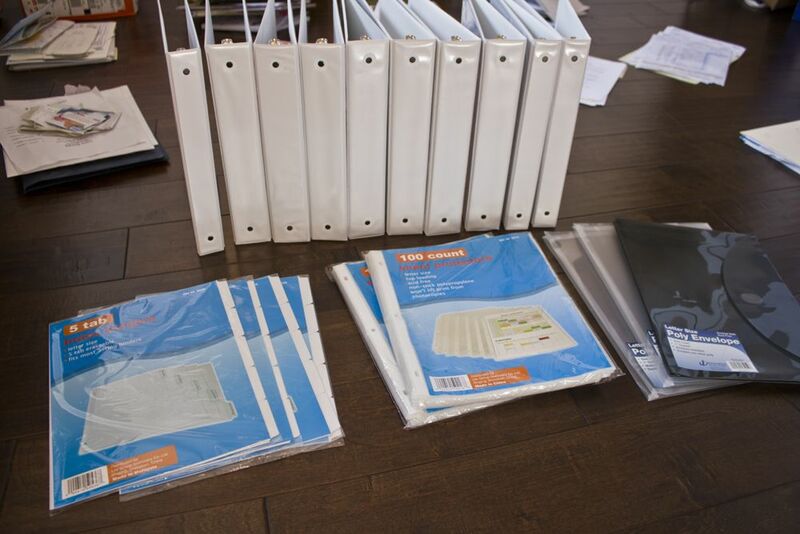 I have one large binder with dividers & page protectors, that is the “grab & go” binder. Inside pocket contains a large zip tight bag to enclose the entire binder….living in Florida and originally from New Orleans, our emergency situations tend to be wet! Anyway, the original docs of anything vital or irreplaceable are in the safe box at the bank. Copies of these are in the binder. Looking forward to future Jenna Sue projects & bloggings! Best wishes to all! Thank you! This is inspiring! 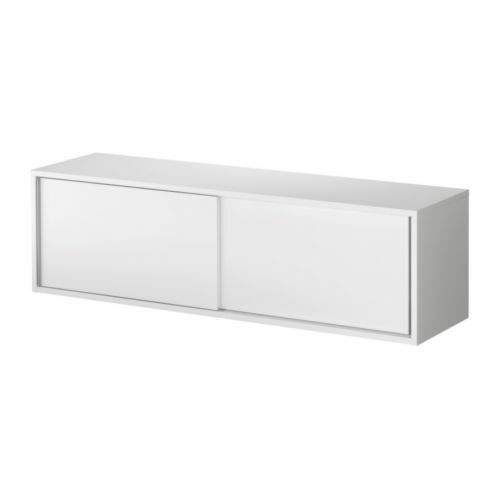 I wasnt quite sure what I was looking for when i googled “file cabinet alternative”- you were the first result, and I think thats what I am goign to do! Great thinking. I used to work in a staples and now I have sooo many notebooks and binders. I just don't know how to organize them. Do you have any ideas ? Maybe bins or plastic containers ? If they will be out in the open, I think bins would be a good idea assuming you don't use them frequently. 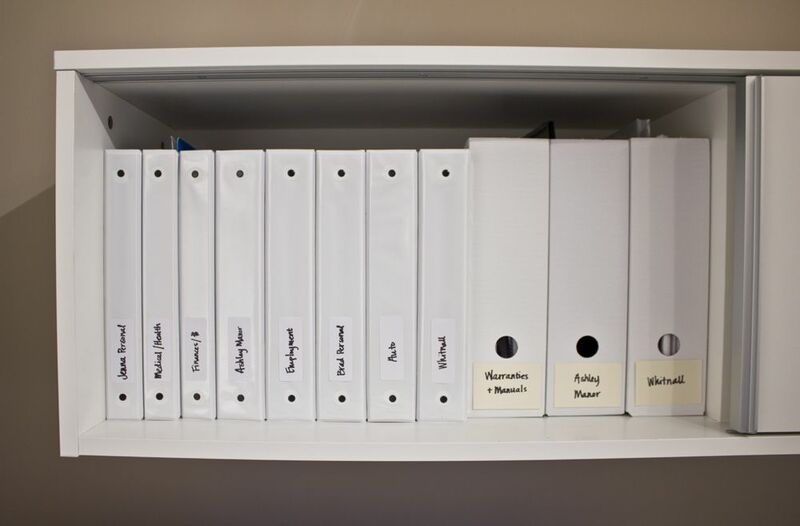 For binders, I like to have them all consistent and labeled (like I did with this project). 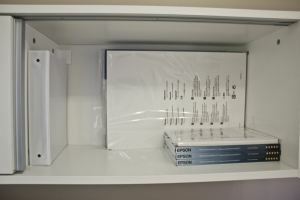 That way you can store them on a shelf for easy access without it being cluttered looking. 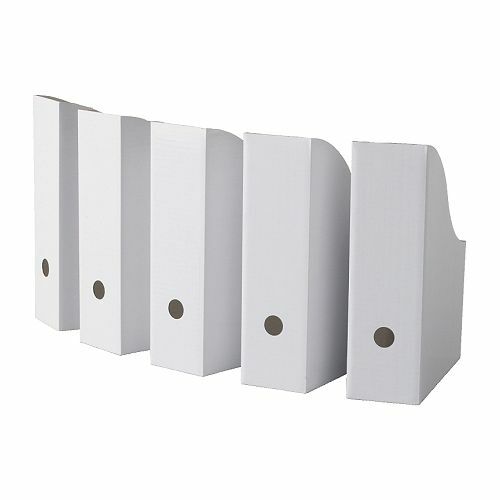 Did I miss something in the quick reading or visual of these magazine holders; did you buy them from Ikea in white or spray paint them? Aren't they made of cardboard? I have been doing genealogy research for 30 plus years and I have either purchased 3 ring binders, bought them at yardsales, thrift stores or some were given to me so needless to say, I have a hodgepodge of all different kinds. I would like to replace them with the all white or maybe a same color. Most of your white ones have the plastic covering on front and back and you can slip in a letter size page and also make a label out of cardstock to place inside the spline for identification. Replacing them is going to be expensive . If they don't have the plastic/clear vinyl cover, can you open the notebook out flat and try to spray paint it? Would this work? 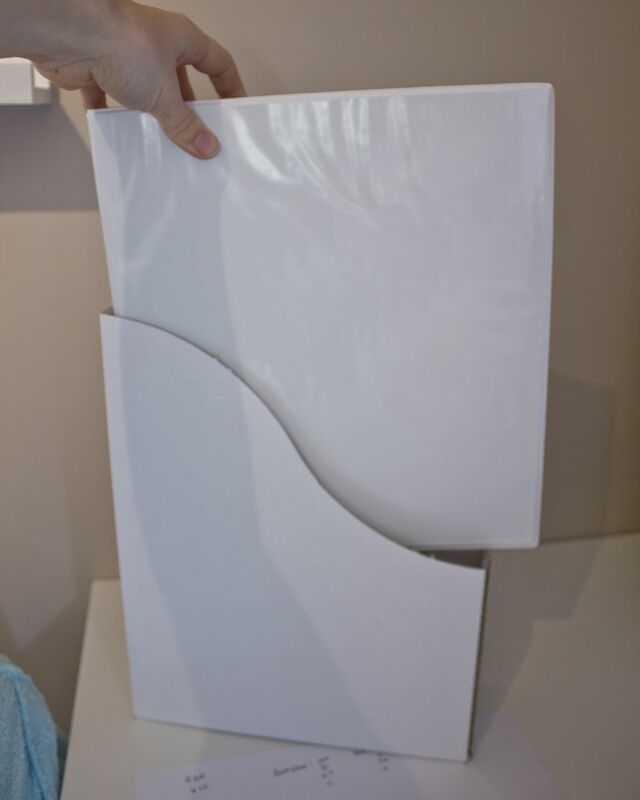 Do you suggest using primer spray paint first, let that dry for a few days, then try a flat/or glossy white paint? Would I need a sealer? Are the labels that you put on the spline of the notebooks made with a label maker and stuck on outside of notebook? It looks like they are plain white labels written in your own handwriting and stuck on outside of notebook spline. Sometimes my eyes don't see things clearly. The magazine holders are white cardboard from Ikea, yes. I'm not sure if I would spray paint something that is going to be bent and handled so often, I'd worry about it scratching off easily. I think you're better off just getting white binders. Somewhere like the dollar store may have them cheaper than Target or Walmart. Or you can try cutting decorative paper to fit and using spray adhesive or modge podge. 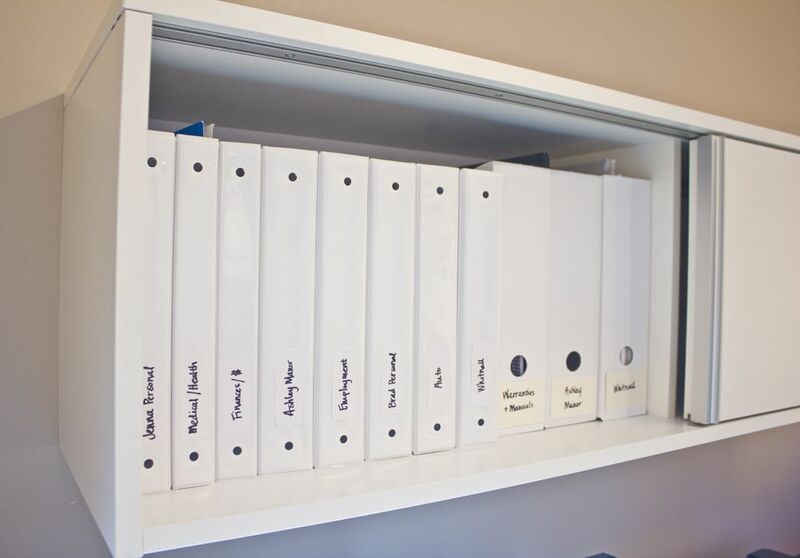 I just organized all of my papers into binders and while I like the idea, my plastic inserts (once filled) hang several inches lower than the binders. So they don't slide on and off the shelf easily and kinda look like crap. Any suggestions? I bought the sleeves from walmart, maybe that is my issue. I also just have paper in them and not passports, etc so it's nothing that is super heavy. Hmm… that didn't happen to me, very strange. Maybe the sleeves are just too flimsy? I would try different sleeves and see if that solves the problem. What do you use for your bills? I have mesh baskets full of papers to file and I don't want to go the file cabinet way, but haven't come to a better solution. I tried the binders but hated opening them up every-time a bill came, punching holes in the papers etc. Hmm, well, we receive and pay most of our bills online. The ones that come in the mail we just trash after paying them—there are records of everything online so we've never had an issue with this. The super important ones we keep in sleeves in the appropriate binder. 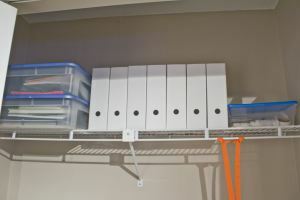 If you have a bunch, I'd probably use those shallow letter sized boxes to organize and store them in. Hope this helps! 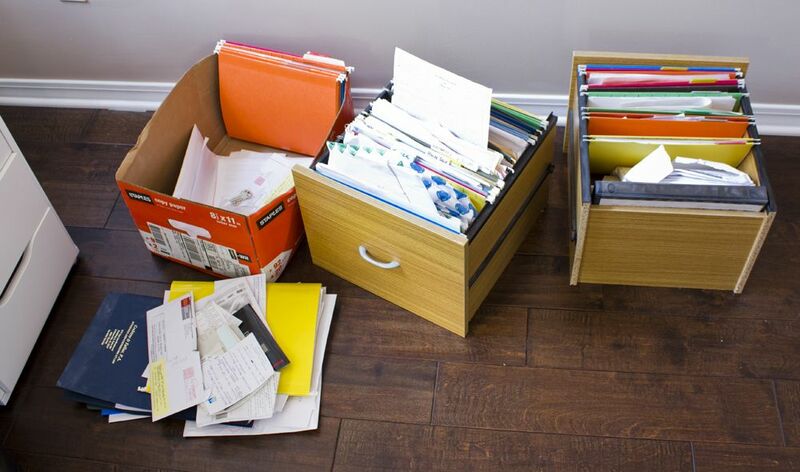 Glad I came across your article “My alternative to the file cabinet”, as one of my new year resolutions for 2015 was to get on top of my paperwork. Your system is simple yet efficient … and has already inspired me to tackle my paper mess. I also started by discarding a lot of old paperwork, catalogues, brochures etc. that had accumulated over the years. Then yesterday bought myself 8 binders, dividers etc. today I have filed away most of the paperwork and should be all done by the 5th of January. I really like your website! However, I’m disappointed that you don’t have responses to any of the questions your readers have posted. Do you ever respond? The questions are great and you’d be helping us unorganized people out so much if you answered a few. Hi Janine, I’ve replied to most of them! What is your question?